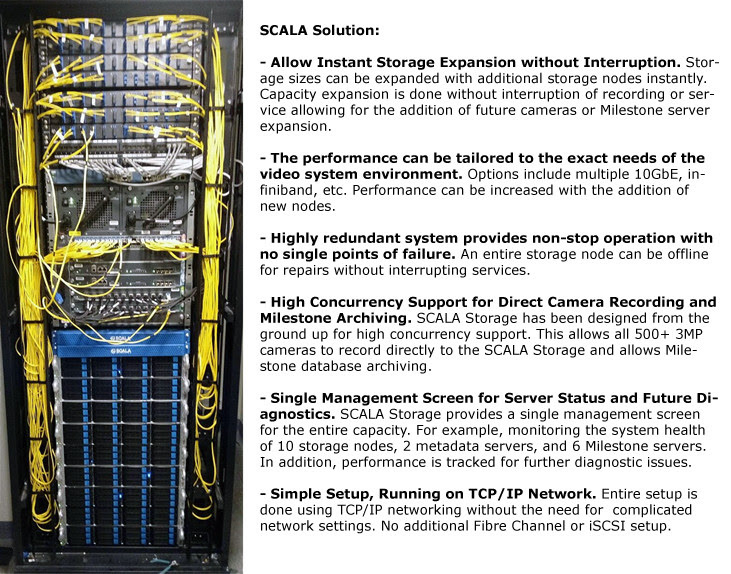 SCALA, developed by SANS Digital, is proud to announce the successful installation of a 1PB central storage solution for over 500+ HD video surveillance cameras. In order to provide enough resources to several Milestone VMS Servers, each SCALA node is configured with 2-port 10GbE connections. The entire solution is able to sustain an aggregated bandwidth of over 7GB/s (7000 MB/s), preventing drops in video frames or low response times for users reviewing recorded video. Furthermore, easy expansion allows growth for infinite amount of video recording retention while the SCALA system provides full redundancy with no down times. The result is a truly all-in-one storage solution for mission critical video surveillance recordings for Milestone VMS. Enough bandwidth to record 500+ HD cameras in a shared environment. Mission Critical: Continuous non-stop recording to fulfill the needs of the customer's establishment. A large network bandwidth requirement for recording, playback, and archiving of all 500+ HD security videos. Simultaneous high file operations of 500+ cameras equaling to 500+ write operations. Especially during high playback (read operation) and archiving (read and write). Ability to expand within the shared data location without interruption to services. Easy to manage GUI for over 1PB storage with preemptive failure notifications.